Child abuse is my least favorite subject to read about in fiction. Having reviewed two books this week in which parents systematically reduce a child to emotional rubble, I feel shaken and a bit ambushed, especially because I wasn’t expecting it. The publishers’ synopses said nothing about it, so I guess I’m not the only one who minds. However, the flap copy for The Hollow Ground does compare the novel’s child narrator, Brigid Howley, to Scout Finch in To Kill a Mockingbird, and I have to say, Harnett earns the comparison. The story unfolds in the Pennsylvania coal fields in the early 1960s, vividly and excruciatingly rendered through Brigid’s eyes. She’s the most rounded, complete child narrator I’ve read in years: perceptive, but not unnaturally so; awkward as she should be; struggling to understand the nightmare in which she lives; and, poor soul, trying her damndest to appease the monsters who stage it. Good luck. To top it off, something happened in the mines to her late uncle and her disabled father, which, according to legend, is why her family lives under a curse. Meanwhile, the ground is shifting beneath their feet, literally. 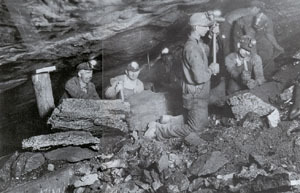 Subterranean fires have closed the mines, throwing thousands out of work. Many houses have collapsed, whereas others have become uninhabitable, whether from carbon monoxide fumes or the tremendous heat. Wallpaper peels, cold water comes from the tap lukewarm, and vegetables ripen in the dead of winter. It’s as if hell has opened its jaws, ready to swallow them, hence the title. But the real hell here is the Howleys. With perfect pitch, Harnett portrays their shifting alliances, which exclude Brigid and sacrifice her for her elders’ purposes. If she speaks up, they slap her down, sometimes physically. If she so much as flinches in humiliation, they pour it on. Her pain or discouragement or disappointment are nothing compared with theirs; how can she be so selfish as to suffer visibly? That’s how life is, they say, and she’d better get used to it. And oh, yes, they blame her for not being able to keep the place clean, taking no account of the inevitable coal dust that covers everything. It was early July and warm but cooler than the hot spring had been. Fireflies lit up the dark hollows of the woods and no matter how bad things were, I couldn’t help but look on their glow as something magical. Sometimes late on clear nights . . . I’d take a blanket into the backyard and lie down to star watch. Whenever a falling star shot a powdery white streak through the sky, I made a wish. Sometimes I wished something horrible would happen to Ma for all the hurt she’d brought us through, but mostly I wished we’d just all be together again and as happy as I’d always thought we’d one day be. All this is quite masterful, yet there’s one terrible, jarring note that nearly undoes the novel for me. Harnett has one character state the theme, that you have to play the hand you’re dealt, no matter how bad it is. No argument there, but the author also seems to say that forgetting the past is the first step. I can’t imagine how such an astute observer of human behavior could even suggest this, or imply that it’s an act of will, especially in the world she’s rendered. The Howleys never say anything genuine about their conflicts with one another, only mouth off to use it as a weapon. Maybe in that sense, they might as well shut up; but even if they did, they wouldn’t forget. And in that benighted Howley clan, only Brigid cares to listen, so there’s no true emotional exchange, no way they’ll ever break the cycle. Which leaves me wondering how in blazes that poor girl will ever learn to play the cards she’s been dealt–and yet, you sense she will.